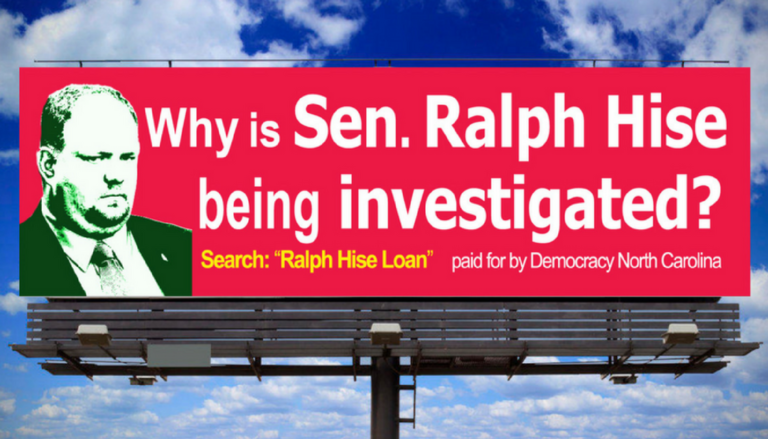 Democracy North Carolina, a voting rights and campaign finance watchdog group, has been trying to post billboards calling attention to an ongoing investigation by the State Board of Elections into the campaign finances of state Sen. Ralph Hise. Hise is a Mitchell County Republican and chair of the Senate Select Committee on Elections; his legislative district covers six counties in western North Carolina. Hall said he was initially encouraged to rent space by sales agents at two companies; he selected billboard locations, submitted the artwork, and sent it back with modifications requested by the agents. He signed a contract with Lamar Outdoor Advertising for a billboard in Mitchell County and a contract with Fairway Advertising for another billboard along I-40 in McDowell County (see board message at: http://demnc.co/billboard). But then, in both cases, regional managers of the companies called to cancel the contracts, saying the message proposed for the billboards “was political and too controversial” or “too controversial and could cause problems for the company,” according to Hall. The managers are: Mr. Chris Colvin, Lamar Advertising, phone number 541-337-5814, 828-396- 8380; and Mr. Neil Drendel, Fairway Outdoor Advertising, 828-713-0269, 828-684-1900. Help Hold Sen. Ralph Hise Accountable by adding your name to a petition calling on the Elections Board to investigate now.